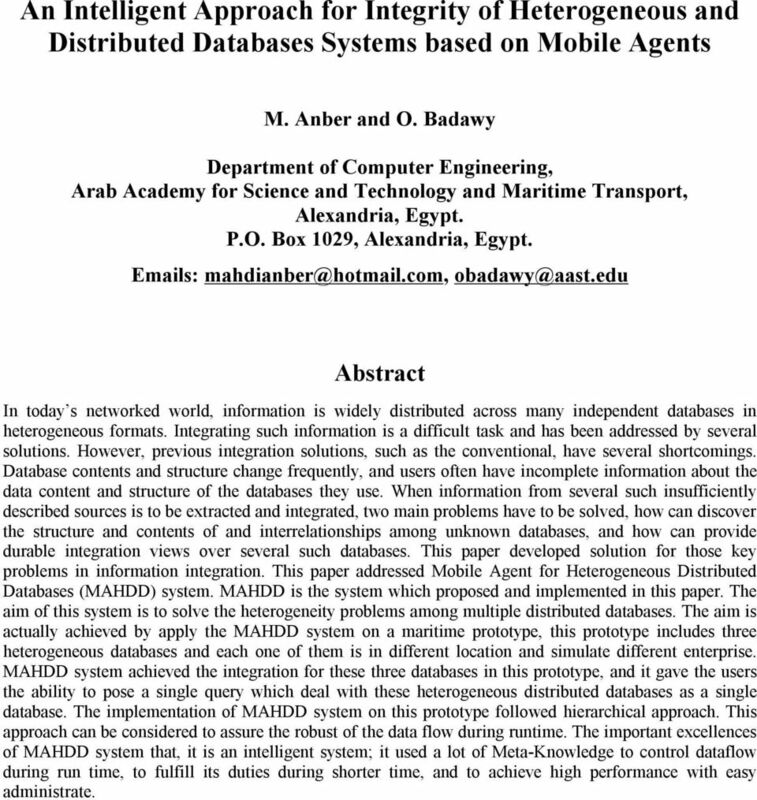 Download "An Intelligent Approach for Integrity of Heterogeneous and Distributed Databases Systems based on Mobile Agents"
1 An Intelligent Approach for Integrity of Heterogeneous and Distributed Databases Systems based on Mobile Agents M. Anber and O. Badawy Department of Computer Engineering, Arab Academy for Science and Technology and Maritime Transport, Alexandria, Egypt. P.O. Box 1029, Alexandria, Egypt. s: Abstract In today s networked world, information is widely distributed across many independent databases in heterogeneous formats. Integrating such information is a difficult task and has been addressed by several solutions. However, previous integration solutions, such as the conventional, have several shortcomings. Database contents and structure change frequently, and users often have incomplete information about the data content and structure of the databases they use. When information from several such insufficiently described sources is to be extracted and integrated, two main problems have to be solved, how can discover the structure and contents of and interrelationships among unknown databases, and how can provide durable integration views over several such databases. This paper developed solution for those key problems in information integration. 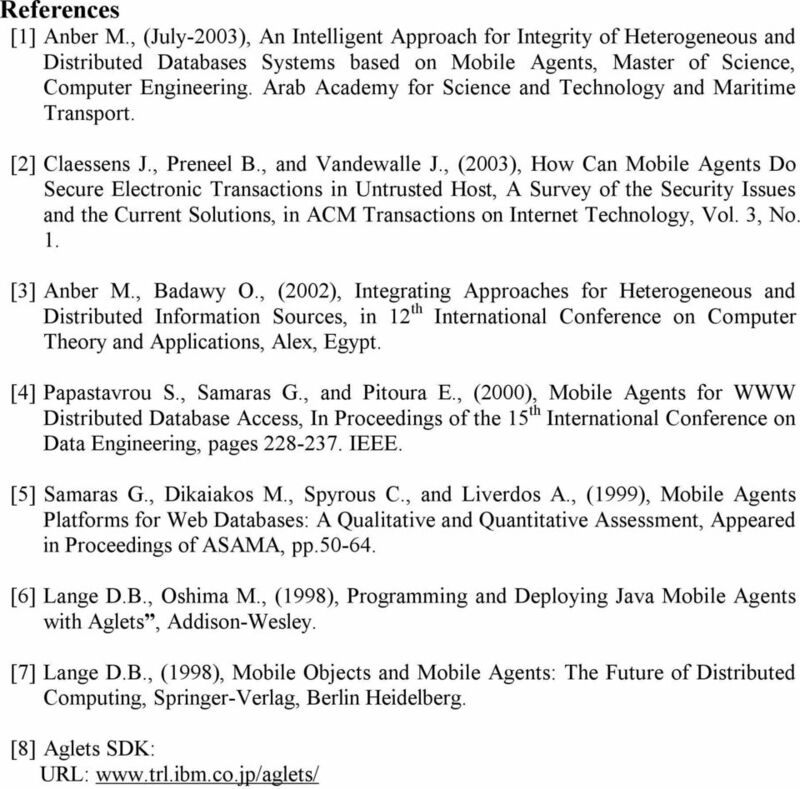 This paper addressed Mobile Agent for Heterogeneous Distributed Databases (MAHDD) system. MAHDD is the system which proposed and implemented in this paper. The aim of this system is to solve the heterogeneity problems among multiple distributed databases. The aim is actually achieved by apply the MAHDD system on a maritime prototype, this prototype includes three heterogeneous databases and each one of them is in different location and simulate different enterprise. MAHDD system achieved the integration for these three databases in this prototype, and it gave the users the ability to pose a single query which deal with these heterogeneous distributed databases as a single database. The implementation of MAHDD system on this prototype followed hierarchical approach. This approach can be considered to assure the robust of the data flow during runtime. The important excellences of MAHDD system that, it is an intelligent system; it used a lot of Meta-Knowledge to control dataflow during run time, to fulfill its duties during shorter time, and to achieve high performance with easy administrate. 2 1 Introduction Mobile agents have a unique ability to transport themselves from one system in a network to another. The ability to travel allows mobile agents to move to a system that contains services they want to interact with and then to take an advantage of being in the same host or network as the service . Bringing new promising possibilities for distributed systems development, mobile agent technology is attractive especially in information retrieval in widely distributed heterogeneous environment, network management, electronic commerce and mobile computing. 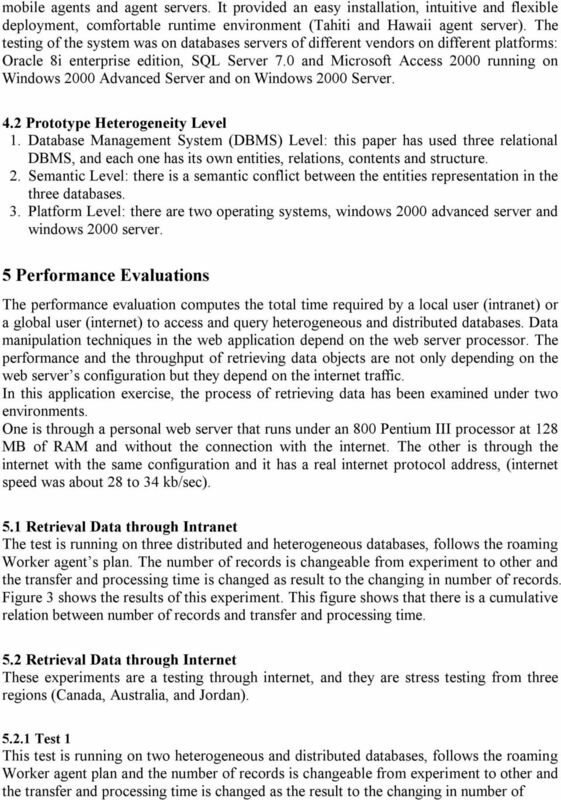 Upon some basic distributed computing models adapted to the mobile agent paradigm, a set of frameworks for distributed database access over the World Wide Web were proposed and tested [1,3, 4, 5]. MAHDD is a system that integrates a set of heterogeneous databases under one virtual global scheme and transparently manages distributed execution of user s global requests, . System services can be accessed via HTML in web browser. The system gives the user the possibility of exploit data stored in multiple remote databases in the same manner as if they are stored in centralized database system. So, the user is shielded from all the complexity of distribution and heterogeneity. The essential features of this system distribution, autonomy and heterogeneity of underlying databases are the crucial issues that determine high complexity of the global system, where as distribution refers to the distribution of data, autonomy deals with distribution of control, and heterogeneity can affect data models, access mechanisms, or other platform specific issues. It is important to note at this point that the mobile agent technology can successfully solve the contradiction between efficient execution and easy administration in multidatabase systems. First of all, installing agent servers providing uniform database access on the database machines that can hide underlying heterogeneity while preserving database autonomy. Secondly, easy administration can be achieved by the fact that local changes maybe done by incoming agents and no additional local access are required. Finally, agent servers and agents can communicate to each other in the sense of fully interconnected network topology, so, the advantage of optimal data transfer during global execution can be exploited. Today s the most utilize model for distributed sources access is the client-sever model that forms two-tier (or generally multi-tier) architecture. The client-server paradigm strictly divides the distributed application code into the server part providing fixed services at the server machine and the client part remotely requesting them, . The mobile agent technology provides an alternative way of distributed programming. The mobile agent technology is based on the idea of process (or thread) migration together with its program code and its execution state to different hosts during the execution time, . This transferable unit is called mobile agent. From the user s point of view, mobile agents are computer programs that can be dispatched together with their data from a client computer to the most beneficial host for remote execution. The decision to dispatch can be done by the agent itself or can be initiated by other agents or an application. MAHDD system is technically based on java technology which is widely considered as a powerful application development tool in mobile computing. MAHDD system has used Java-based mobile agents implemented in Aglet Software Development Kit ASDK [1, 8]. This paper is organized into sections. Section 2 presents MAHDD system architecture. 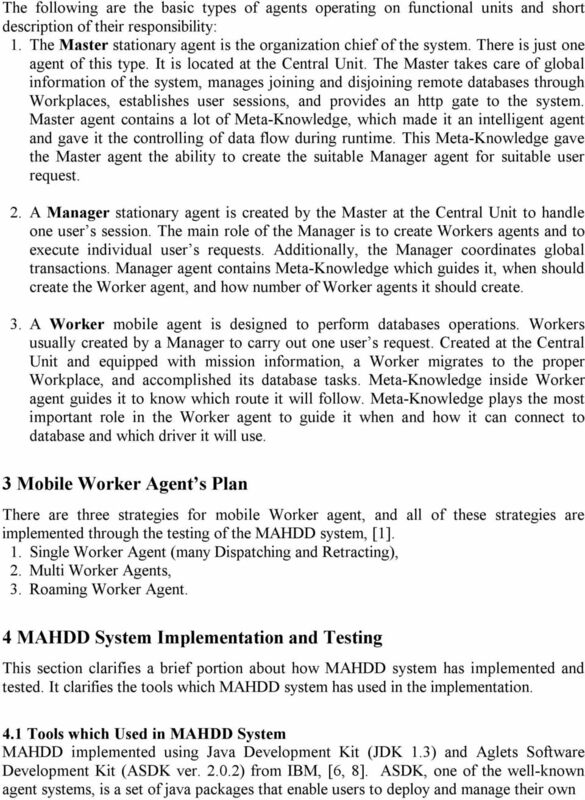 3 Section 3 presents mobile Worker agent s plan. Section 4 presents MAHDD system implementation and testing. Section 5 presents performance evaluation. Finally, section 6 reports the conclusion with future work. 2 MAHDD System Architecture A general architecture and methodology have been illustrated and implemented in MAHDD system is based on software mobile agent as show in Figure 1. The proposed idea depends on using mobile agents between the remote clients and databases servers machines, . The proposed solution creates and fires a mobile agent (or agents if necessary) that travels directly to the remote Databases (DB) servers. At each DB server, each mobile agent connects to database and performs any queries specified by the sending client. When mobile agent completes its task at the DB server, it sends the results of execution queries back to the client machine through web server. The functionality of MAHDD system is accomplished by mobile and stationary agents that communicate to one another via messages. 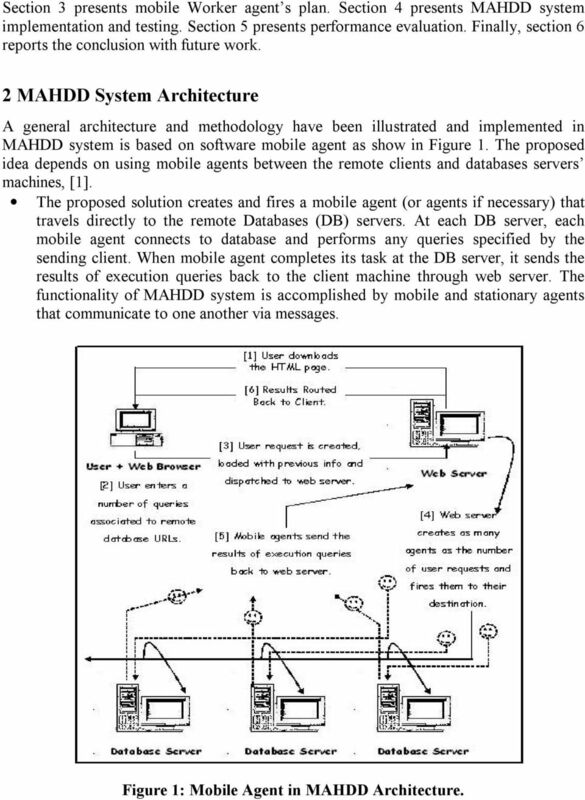 Figure 1: Mobile Agent in MAHDD Architecture. 4 Therefore, each of functional units, which can be identified in the system, must run an agent server to provide agents with the runtime environment. In MAHDD system implementation, used Tahiti agent servers delivered with ASDK packages. MAHDD system comprises functional units of two types: The Central Unit forming the core of the system, Multiple Workplaces units serving as database access points. There is just one Central Unit in the system. The Central Unit acts as a distributed database server. It stores information about the system, accepts user s requests, starts and manages their execution. Additionally, the Central Unit usually stores the program codes of all agents regardless the site on which they will operate later. The Workplaces are the ports from which incoming agents access the databases through the Java Database Connectivity JDBC that is the borderline between uniformly designed global system and possibly heterogeneous databases. A Workplace can connect one or more databases. To establish a Workplace, just a general agent server with appropriate configuration parameters and a proper JDBC driver must be installed at that site. The additional Workplace s functional codes come as agents. The only inevitable information, which the global system must hold to be able to work with database, is the URL of the related Workplace. The logical concept of functional units does not require their distribution to different sites. If advantageous, several Workplaces can run on the same machine. 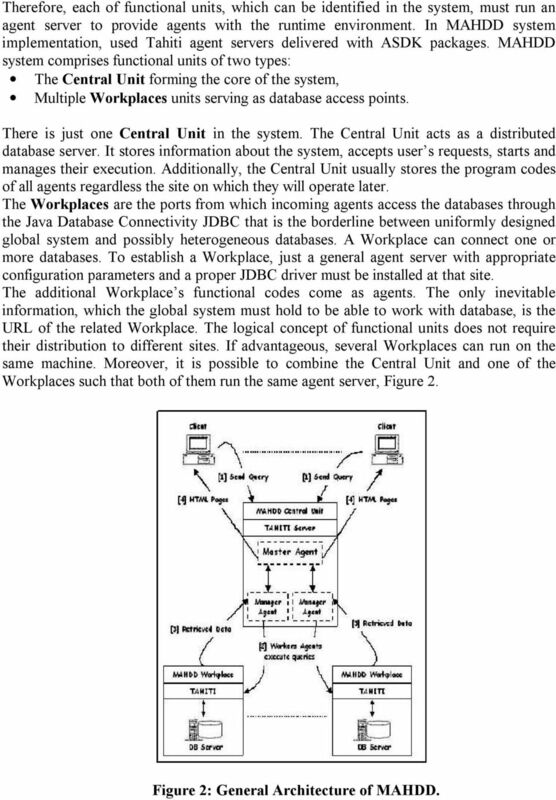 Moreover, it is possible to combine the Central Unit and one of the Workplaces such that both of them run the same agent server, Figure 2. Figure 2: General Architecture of MAHDD. 7 records. This test is performed between web client in Canada and distributed servers in Egypt Transfer + Processing Time (sec) Y Data Size (records) Figure 3: Testing through Intranet. Figure 4 shows the results of this experiment. 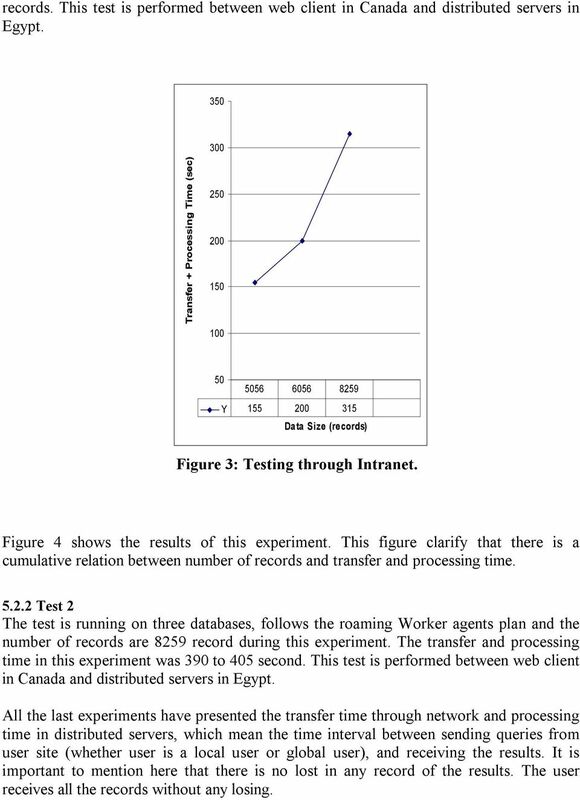 This figure clarify that there is a cumulative relation between number of records and transfer and processing time Test 2 The test is running on three databases, follows the roaming Worker agents plan and the number of records are 8259 record during this experiment. The transfer and processing time in this experiment was 390 to 405 second. This test is performed between web client in Canada and distributed servers in Egypt. All the last experiments have presented the transfer time through network and processing time in distributed servers, which mean the time interval between sending queries from user site (whether user is a local user or global user), and receiving the results. It is important to mention here that there is no lost in any record of the results. The user receives all the records without any losing. 8 Transfer + Processing Time (sec) Y Data Size (records) Figure 4: Tes1 through Internet. 6. 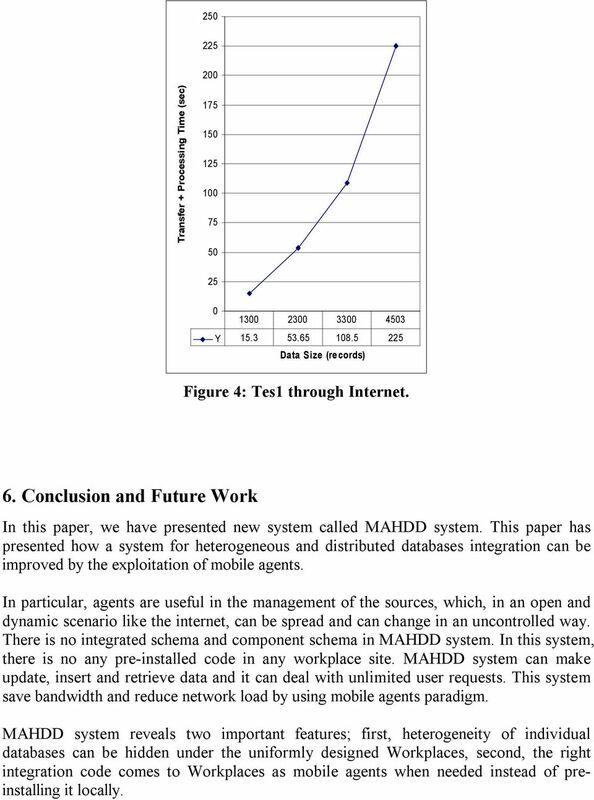 Conclusion and Future Work In this paper, we have presented new system called MAHDD system. 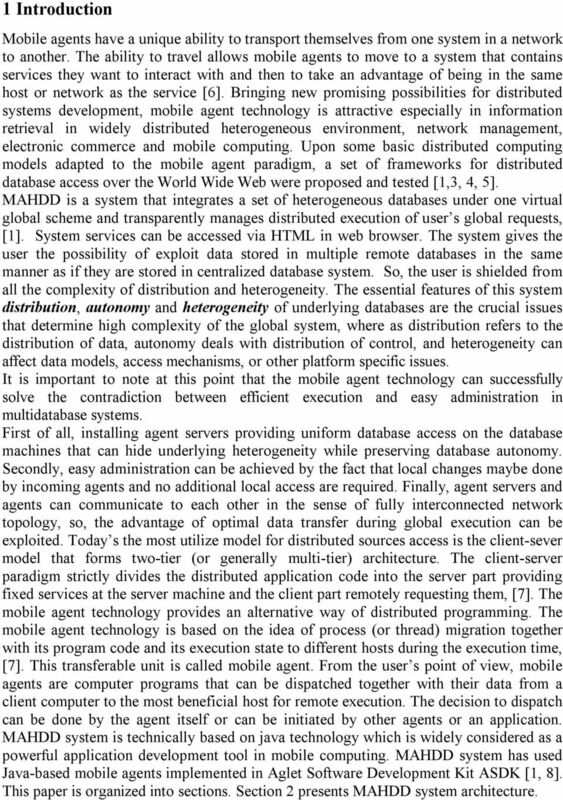 This paper has presented how a system for heterogeneous and distributed databases integration can be improved by the exploitation of mobile agents. In particular, agents are useful in the management of the sources, which, in an open and dynamic scenario like the internet, can be spread and can change in an uncontrolled way. There is no integrated schema and component schema in MAHDD system. In this system, there is no any pre-installed code in any workplace site. MAHDD system can make update, insert and retrieve data and it can deal with unlimited user requests. This system save bandwidth and reduce network load by using mobile agents paradigm. MAHDD system reveals two important features; first, heterogeneity of individual databases can be hidden under the uniformly designed Workplaces, second, the right integration code comes to Workplaces as mobile agents when needed instead of preinstalling it locally. 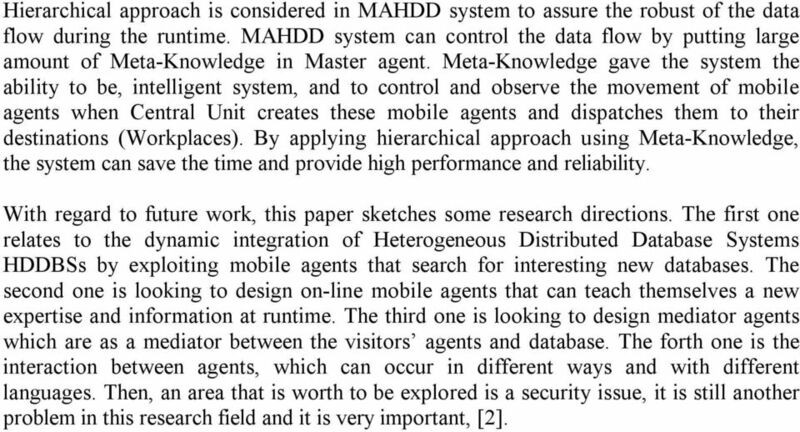 9 Hierarchical approach is considered in MAHDD system to assure the robust of the data flow during the runtime. MAHDD system can control the data flow by putting large amount of Meta-Knowledge in Master agent. Meta-Knowledge gave the system the ability to be, intelligent system, and to control and observe the movement of mobile agents when Central Unit creates these mobile agents and dispatches them to their destinations (Workplaces). By applying hierarchical approach using Meta-Knowledge, the system can save the time and provide high performance and reliability. With regard to future work, this paper sketches some research directions. The first one relates to the dynamic integration of Heterogeneous Distributed Database Systems HDDBSs by exploiting mobile agents that search for interesting new databases. The second one is looking to design on-line mobile agents that can teach themselves a new expertise and information at runtime. The third one is looking to design mediator agents which are as a mediator between the visitors agents and database. The forth one is the interaction between agents, which can occur in different ways and with different languages. Then, an area that is worth to be explored is a security issue, it is still another problem in this research field and it is very important, . What Is the Java TM 2 Platform, Enterprise Edition? Web. Studio. Visual Studio. iseries. Studio. The universal development platform applied to corporate strategy. Adelia. www.hardis. The SAS Cost and Profitability Management client is only available on a Windows operating system. Data Integration Executive Summary Lacking proper tools, the vexing challenges relating to bringing two organizations together deadly serious business for an entire corpus of employees, owners, and clients. Lecture 26 Enterprise Internet Computing 1. Enterprise computing 2. Enterprise Internet computing 3. Natures of enterprise computing 4. What is Middleware? Software that functions as a conversion or translation layer. It is also a consolidator and integrator. What is Middleware? Application Application Middleware Middleware Operating System Operating System Software that functions as a conversion or translation layer. It is also a consolidator and integrator. FileMaker 12 ODBC and JDBC Guide 2004 2012 FileMaker, Inc. All Rights Reserved. FileMaker, Inc. 5201 Patrick Henry Drive Santa Clara, California 95054 FileMaker and Bento are trademarks of FileMaker, Inc.